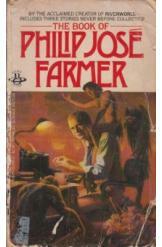 The Book of Philip Jose Farmer Sci Fi. Book is in fair condition, all pages intact. A collection of short fantasy and scifi stories by Philip Jose Farmer, including "My Sister's Brother," "Skinburn," "The Sumerian Oath," and over a dozen others. Also includes "Thanks for the Feast" by editor Leslie A. Fiedler.